This long weekend, I did some serious baking. We baked bread, made a large batch of a master baking mix (for future biscuits, pancakes, and muffins), and these whole wheat dinner rolls, which could also be used as hamburger buns. They're so good, I've marked the recipe in my book like this: *fabulous! The kids ate three apiece hot out of the oven, and Albus said that if we were selling these, and someone bought one, they would take one bite and tell everyone else to come and try some too. 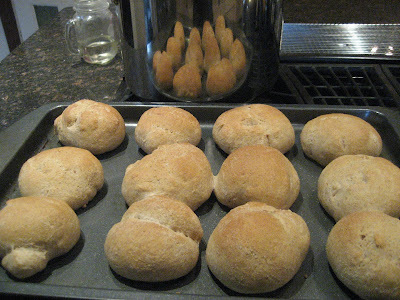 The recipe comes from my MCC More with Less cookbook, and makes four dozen large rolls. In a large basin, dissolve 4 1/2 teaspoons of yeast in 3/4 cup lukewarm water. Once dissolved (about five minutes), add 3 cups warm water, 1 cup dry milk powder, 1/2 cup oil, 2 eggs, 1/3 cup honey, and 2 teaspoons salt. Have ready 6 cups white flour, 4 cups whole wheat flour. Add 5 cups of flour and beat thoroughly with electric mixer (or by hand). Stir in an additional 3 cups of flour, then knead in the rest (adding more as needed). I use local hard bread flour. Knead till smooth and elastic. Oil dough/bowl, cover, and let rise until doubled (about two hours). Punch down and shape into dinner rolls on greased trays. I placed twelve buns on each tray. Cover, let rise (an hour or two), and bake 20-25 minutes at 375 degrees. We've frozen those we won't be eating fresh. Enjoy!